There are 3 main types of DVI Cables. DVI-A (Analog), DVI-I (Digital/Analog) and DVI-D (Digital Only). The DVI-A is not used as much anymore. 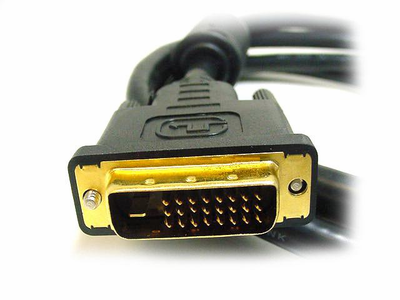 The DVI-I used to be the most common, but as more and more TV's and Monitors become available, most of the connectors are DVI-D. A DVI-D cable will fit into all types but only allow the Digital Signals to be transmitted. The DVI-I cables will only fit into DVI-I sockets. If you have a DVI-I on one side and DVI-D on the other, then simply get a DVI-D cable. There are also single link and dual link cables. Single Link DVI supports a maximum bandwidth of 165MHz (1920x1080 at 60Hz, 1280x1024 at 85Hz) and utilizes 12 of the 24 available pins. Dual Link DVI utilizes all 24 available pins and supports 2x 165MHz maximum bandwidth (2048x1536 at 60Hz, 1920x1080 at 85Hz). A single link cable is also all you would normally need to get HD from your DVD Player to your TV. Dual link is not required for that purpose.